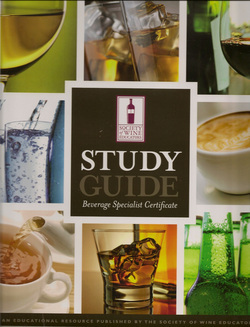 Taste & Compare Academy offers a program from the Society of Wine Educators representing the SWE's recognition that the holder has attained a broad base of knowledge about the beverage industry equivalent to an entry-level hospitality professional. The entire package offered by Taste & Compare includes the BSC Study Guide (pictured), a comprehensive teaching presentation by highly professional educator/specialists, and arranging for examination sittings with the Society. All at one cost. The examination for the BSC consists of 40 questions, completed in one hour, with a pass score of 60% or higher.